There are many recent novels for children that I’ve greatly admired, but I know very well that the child me would never have chosen them or enjoyed them. They are too sophisticated for somebody still finding their feet on the reading front in later primary school years. Eva Ibbotson’s romantic funny fast-moving adventures are books which I would have loved reading then, as I do now, … and so too is ‘A Boy Called M.O.U.S.E.’. Penny Dolan has imaged for us a richly fun and exciting world of caricature dreadful/wonderful/scary/funny/fascinating characters and places, Dickensian in style and epic in scope. This is a moving adventure story full of twists and turns, feeding small clues that lead us on, ever hopeful for a happy ending even when hope all seems lost. Short chapters make this a compelling ‘just one more’ kind of a read. Most of those chapters have Mouse telling his own tale of the cruel bullying and deprivation at Murkstone Hall School, the happier times of escapades shared, lessons learnt and friends made with an old puppeteer, a tramp, a watch mender, and a wonderful theatre full of exotic characters young and old. But there are also chapters which give glimpses of things happening that Mouse himself is unaware of; the Child Snatcher-like Mr Button tracking ever closer, the lost-at-sea parents whose existence Mouse knows nothing of, now returning home in the hopes of finding their son. There’s a wonderful thrill and tension in our knowing more than Mouse does! 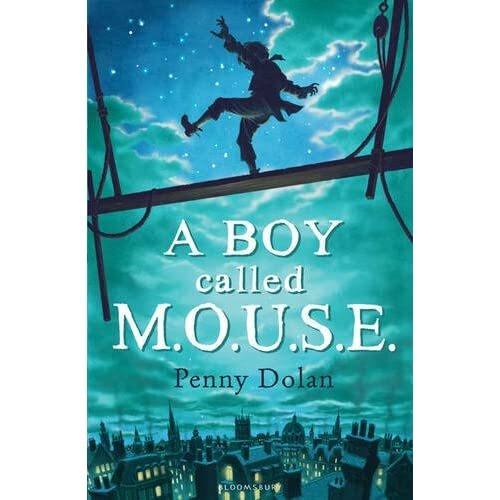 The many characters, with their wonderful names (Scrope, Shankbone, Niddle, and many many more) are all complex and compelling and often strange, in contrast with Mouse himself who is a very ordinary boy, but one with an exciting ability to climb and walk up high. Other than the climbing, Mouse is a kind of Every Child character who is easy to identify with, so we ‘live’ his exciting, romantic adventure with him. The impulse that fires this dramatic story along is one that any child can relate to: Mouse’s need to find his ‘Ma’ (“Ma, Ma, whoever you are…”), even though she isn’t actually his mother at all. The fuel that powers the story along is that universal child passion; ‘it’s not fair!’ We read on, hoping, hoping that all will be made fair in the end …. and it is, but not in a pat everything ‘happy ever after’ way. There is scope here for further Mouse adventures. The child me would have also longed to know what happens next. The grown-up me does too. I wonder, is there more to come? A great review. I was just browsing in Waterstones in Piccadilly last night and this book was one of the books that jumped out at me. Sounds like it will be perfect to recommend for a Y6 reading group. A great review for a great book! I've just finished reading M.O.U.S.E on kindle, and every word of the above review is true - and then some! It is the most wonderful, rich, colourful, theatrical book, which I absolutely revelled in. I kept putting it aside because I didn't want to finish it! Another book I must read. But somehow it's not the same nowadays because my children are teens and I no longer read to them. I know I'd have adored sharing M.O.U.S.E. - I miss that. Sounds like a good read. I love the idea of 'warm, oniony greetings'. I can almost smell it. Great review, Pippa. Amazing! Have just glimpsed Cameron on the news talking about education, standards and - no doubt - free schools. Behind him won the library shelf stood a hardback copy of A BOY CALLED MOUSE! Does he even know what kind of "free school" I'd described in it???? Lovely book - a most satisfying read!